Lyndon Rive and DBL’s Nancy Pfund are on the board on of an African version of SolarCity. Off Grid Electric, a micro-solar leasing platform geared toward residents of Africa, just announced that it raised $45 million in debt financing for solar power and battery storage. The Packard Foundation, Ceniarth, Calvert Foundation and other family offices will lend up to $40 million to the fund. The U.S. Agency for International Development's Development Innovation Ventures program provided a $5 million grant. That brings Off Grid's investment total to $70 million this year including a $25 million Series C in October led by DBL Partners along with Western Technology Investment, SolarCity, Omidyar Network, Serious Change LP, Vulcan Capital and the private investment firm of Microsoft co-founder Paul Allen. DBL's Nancy Pfund joined Off Grid Electric as board chair at the time of the investment. SolarCity CEO Lyndon Rive is also on the board. Last year, Off Grid Electric raised $23 million. Off-grid renewable energy companies have raised close to $200 million this year versus the roughly $64 million invested in off-grid solar solutions last year. The company is looking to scale up its partnership with the Tanzanian government to power 1 million homes by 2017 and to enter its second African market, Rwanda. Based in San Francisco, Calif. and Arusha, Tanzania, the startup claims that it is installing solar in "over 10,000 new homes and businesses per month" and employing more than 800 people in Tanzania. The company's CEO sees the entire continent as a potential market. “We have pioneered a business model that allows consumers with no formal credit to use their existing energy budget to finance solar. We simply redirect funds they were already paying for kerosene and batteries to a solar lease payment,” said Xavier Helgesen, co-­founder and CEO of the startup. Helgesen called it the "first financing vehicle of its kind for distributed solar in Africa and a critical milestone in the creation of a new asset class of institutional and impact investment." The system typically consists of a 50-watt solar panel and a lithium-ion based battery capable of powering lights and small appliances for a few hours in a 12-volt DC system. The CEO said the lithium battery system looks like a consumer appliance that is combined with a charge controller and a payment management system. Helgesen said that the firm has "dramatically reduced cost" with "tremendous economies of scale" while selling "direct to the customer with no middleman." The CEO suggested that just as financing solar became a "no-brainer" in the U.S. with the advent of third-party ownership, Africa will develop its own profit- and entrepreneur-building microleasing system. "I'm amazed by how many people pay for the system by charging neighbor's phones," said the CEO. Another budding Netflix CEO charges neighbors to watch a TV powered by a solar-charged battery. GTM's Katherine Tweed has reported that Off Grid Electric uses a mobile-payment platform to allow customers to purchase energy in small amounts, essentially using a micro-solar leasing model. She notes, "There are different levels of service available. The basic service costs about $6 to set up and about $6 per month, less than what most people pay for kerosene. It comes with LED lights, a radio and a USB charger. Unlike kerosene, which offers poor light and spews toxic fumes, the electricity from solar provides better lighting when coupled with LEDs." GTM Senior Editor Stephen Lacey reports, "The 1.3 billion [people] who have no access to electricity spend an estimated $30 billion annually on kerosene." Most customers start with the basic service, said Helgesen in a previous interview. They tend to upgrade after a few months once they get comfortable with the company’s services and know they’re reliable. Earlier this month, Lacey reported on M-Kopa, another solar firm that helps people pay for PV and lighting systems through a mobile payment system. M-Kopa raised $19 million in a round led by Generation Investment Management. 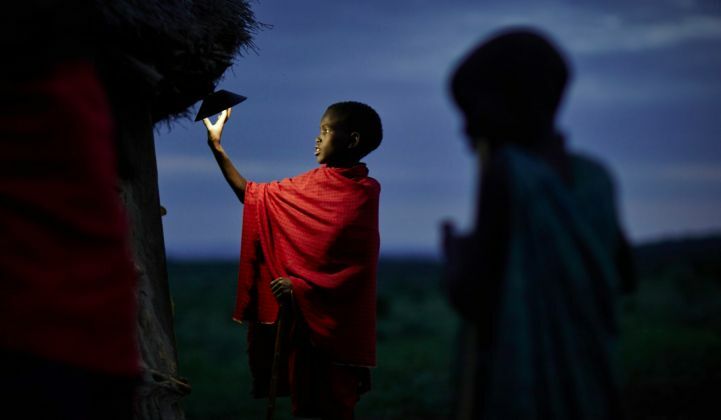 OPIC recently committed $15 million to off-grid power provider Txtlight Power, which operates as Lumos. San Francisco-based startup Angaza recently raised $4 million to scale up its pay-as-you-go electricity model with funding led by an unnamed U.S. family office along with The Social Entrepreneurs' Fund. As Lacey reported, "The pay-as-you-go solar firm BBOXX said it plans to lead the first-ever securitization of off-grid assets. The plan is to lower its cost of capital as it scales in developing countries." There are about 1.3 billion people living without electricity, but there are at least a billion more people with a grid connection that’s often expensive and unreliable. These un- and under-served customers are willing to invest in solutions like solar and energy storage. Nancy Pfund told GTM, "The fact that Off Grid Electric was able to put together a traditional, off-balance-sheet, non-recourse loan fund in a decidedly non-traditional market like Tanzania speaks volumes about what is going on in the region. By stepping up, these foundations and family offices are setting the stage for a future in which Africa benefits from the same kinds of financial instruments that have helped to build the U.S. solar market into what it is today, and we expect many similar funds to follow. As the installations funded by these pioneers come on-line and grow in numbers, the field will be de-risked, and we will see more traditional financial players enter as well." She added, "This fund...is an important financing step toward not only an affordable, distributed clean energy opportunity for Africans, but also an important job-creation tool to bring more Africans into the ranks of the middle class."